The Power of the Mother Goddess is perhaps greater than that of any other God. She is even worshipped by all the Gods themselves. 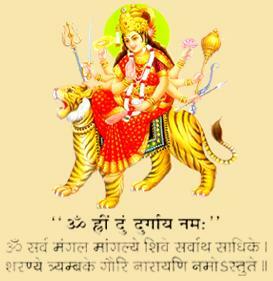 She is Shakti the power of Brahma, Vishnu, and Mahesh. She takes the form of their consorts, without whom, none of the Gods can achieve anything. She is worshipped all over India with the same ardour under different names and manifestations - the most benign face of the goddess is Durga Durga puja is performed twice in a year - for nine days each time - once March or April, and again time in September or October. According to the Hindu calendar when Durga puja is performed it is the month of Chait. The festival is celebrated during the moonlit fortnight of the month, the first day being Parva. Chait Devi puja is done for eight days, the ninth day being Ram Navami. In winter, the month of celebration is Kwar and, again, the puja starts on Parva of the moonlit fortnight. During Kwar the puja goes on for nine days and the tenth day in Dussehra. Some people like to fast, phalar andd special food for these days such as potatoes,kkuttu atta,milk products such as paneer is allowed once a day and liquids can be taken any time. Some persons observe the fast only on the first day and the last day, but some observe it for the full nine days.People who do not fast also generally do not take meat and alchol.